The Temple, situated in the Forum, is dedicated to goddess Roma and Emperor Augustus. It was constructed between the year 2 BC and AD 14 when the Emperor died. According to its shape it follows the typical pattern of temples. 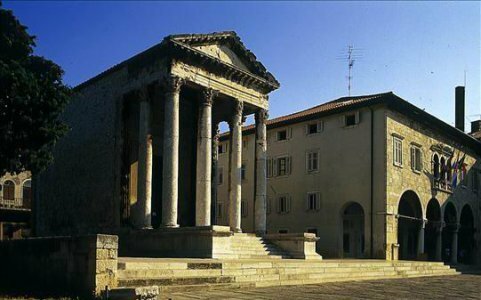 The function of the Temple changed through the years: with the ending of the pagan ancient era its original pagan function ceased and the temple was afterwards used as a church, granary, and in the beginning of the 19th century it was a museum for stone monuments. In 1944 it was hit by a bomb and completely destroyed. It was reconstructed between the years 1945 and 1947 and nowadays it houses a collection of ancient stone and bronze sculptures. The other twin temple, of which only the back wall is preserved, is believed to have been constructed at the same time and in the same style and was called the Temple of Diana.